Ben Fairlie was so heavily under the influence of drugs that police officers had to help him stand up when they eventually managed to rouse him. Perth Sheriff Court was told that Fairlie, who had taken a cocktail of medication, was slumped over the steering wheel with the engine of his Peugeot 308 still running. 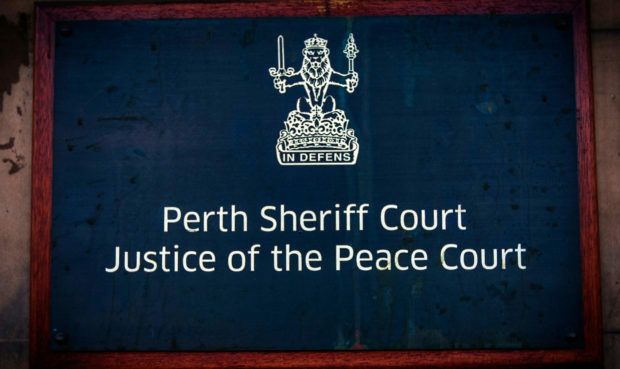 Fairlie, 34, was on bail for drink- driving when he was found to be in charge of a vehicle while unfit through drink or drugs in Rose Terrace, Perth, on October 13. He admitted that offence – and also driving while unfit through drink or drugs on the A85 on July 25 – when he appeared in the dock at Perth Sheriff Court yesterday. Concrete worker Fairlie had sentence deferred for reports. He was banned from driving on an interim basis yesterday and Sheriff Keith O’Mahoney said he would consider a Crown motion to forfeit the car, worth £2,580. Depute fiscal Matthew Kerr told the court that in the first incident police were already searching for Fairlie’s car when officers saw him drive up the wrong side of the road. “It was immediately obvious to both officers that the accused’s speech was slurred and he was unsteady on his feet,” Mr Kerr said. “He told officers he had consumed some alcohol but had vomited it straight back up. A roadside breath sample was negative. In the second incident, his car drew attention because it was sitting parked for more than half an hour with the engine running and the lights on. A witness eventually spotted Fairlie slumped over the steering wheel and he went to remove the keys from the ignition. They shook his shoulders and tapped his head but could not wake him up. Mr Kerr said: “The witness noticed white powder on the passenger seat and the police were contacted. “Police found him in an incoherent, semi-conscious and drowsy state. His speech was very slurred and he struggled to keep his eyes open. Fairlie was kept in custody overnight on both occasions. Sheriff O’Mahoney imposed an interim driving ban on Fairlie, from Gilmerton, and sentence was deferred for the preparation of reports.